This is a continuation of Part 1. This second part of the review will cover Bluestorm Z2, and Bluestorm Z3, and Bluestorm Big Slam. Bluestorm Z2 features a soft topsheet with the same 47 degree sponge found on Z1. When squeezing the sponge its density is apparent though not as much as Z1 Turbo. Z2 is the third hardest rubber in the Bluestorm series. The topsheet is indeed noticeably grippy with that familiar German grain. Bluestorm Z2 while capable of very high speeds, has noticeably more control than the Z1 rubbers. While the difference in speed between Z2 and Z1 is apparent, I need to stress that this rubber is far from slow and is quite powerful overall. The sponge is the same as Z1 so the difference is in the topsheet. The softer topsheet of Z2 allows for an increase in feel and dwell time. This is something I greatly prefer and makes this rubber a pleasure to play with. The feeling and the sound are quite present on all strokes and especially on flatter, thicker shots that penetrate the sponge. That being said, I find Z2 to be only ok at flat hitting. While not bad, Z2 is a rubber that begs you to spin with it. The throw angle of this rubber is medium high. To me, it was reminiscent of Evolution EL-S in throw angle and general play style. This results in a rubber that produces heavy amounts of topspin and make it great for opening loops. The spin it can create is comparable to even that of its early predecessor Baracuda. Serving with Z2 was quite good. The softer topsheet and slightly less bounce compared to Z1 made an improvement in this department. Z1 is a little difficult to keep short and while I wouldn't say Z2 is easy, it's a little better. The short game of Z2 is overall easier than with Z1. The extra speed of Z1 can technically produce faster flicks but it doesn't really matter if most of them miss the table during game time. The extra dwell is welcome for a lower level player like me but this rubber is more than fast enough for players that are way higher than I'll ever make it to. As far as chopping goes with Z2, it's not garbage but it's definitely not designed for chopping. The extra dwell compared to Z1 helps a touch but I have a lot of trouble chopping with sponges that are on the harder side and Z2's sponge is still on the harder side. Blocking was good but was quite different compared to Z1. The higher throw angle is a negative for blocking but I found the dwell and slower speed allowed for easier control of incoming speed. However, the drawback of this is that blocks come back a bit slower and are a little less threatening than with Z1. Lobbing, lifting, and fishing are good but I would say this is one of the rare instances where I don't prefer extra dwell time. You can get the ball to do what you want to an extent but it seems to have less spin and speed compared to Z1 for these strokes. Driving is very good with Z2. Of course, Z1 really excels at this stroke so it's almost unfair to compare the 2. Though Z1 can produce a more powerful drive, Z2 makes literally strokes easier to perform. So yes, driving with Z2 is a bit slower but they are easier to do and the same harder sponge allows them to still be very fast. Z2 is a looping king. If Z1 rocks the house with driving, Z2 knocks it down with looping. Heavy topspin is almost an understatement. Loops are comfortable and fun to execute, all while having several gears from low to very high. At that high end, powerloops are very effective and deadly. It's great feeling shines the most on counterloops at mid distance. This rubber has been crafted for looping and it shows. Bluestorm Z3 features a soft topsheet with a medium soft 42 degree sponge. When squeezing the sponge, the drop from the 47 degree sponge found on Z1 and Z2 is significant. Z3 is tied for having the softest sponge of the Bluestorm series, but to me, feels the softest overall. The topsheet is indeed noticeably grippy with that familiar German grain. Bluestorm Z3 is far softer than its 3 harder siblings. This makes Z3 the biggest departure from the series because of this. It is soft in both topsheet and sponge which results in a tensor with a sort of allround+ speed and is far slower than Z2. It can still of course hit fast offensive shots but this is the version of Bluestorm for people who are trying to have control over the pace of a rally and who want to have an increased ability to return fast shots from their opponent. The feeling is quite nice for those that like softer rubbers but I felt that the sound wasn't quite as loud as Z2. It would be inaccurate of me to say that flat hitting is a strength of this rubber. The speed is a bit too slow for it to be very effective and the dwell time isn't helping it either. The throw angle of this rubber is medium high. Spin is very high and I was glad to see that the reduced speed didn't prevent it from loading the ball up with spin on all strokes. Serving with Z3 was really good. The softer topsheet and less bounce compared to the other Bluestorms allowed for well placed serves with high spin. The reduced speed allows the ball to be kept short easier and placed on specific points easier as well. The short game of Z3 is overall easier than with the harder Bluestorms. Short game strokes were very easy to do and I found myself making shots more consistently than with the other Bluestorms. Even though it's slower than the other Bluestorms, it's not a slow rubber so with some effort it's still capable of good speed on flicks just not as much as something like Z1 of course. Z3 is my favorite Bluestorm for chopping. I enjoy chopping with softer rubbers. So the softer it is, the better I can chop with it. Thus, I had good feeling, spin, and consistency on my chops relative to any other Bluestorm. Blocks were easy to land on the table but were mostly non-threatening. The higher throw angle is a negative for blocking but I found the dwell and slower speed allowed for easier control of incoming speed. However, the drawback of this is that blocks come back a much slower and are much less threatening than with the other Bluestorms. Lobbing, lifting, and fishing were difficult to make it back to the table. At such a long distance, the ball runs out of steam fairly quick. A lot of effort needs to be made and even then, the spin and placement of the ball felt inconsistent and unstable. Fortunately, with my playstyle, I don't need to execute these strokes regularly. Driving is ok with Z3. The other Bluestorms are stronger in this department for sure. Of course, a good drive can be performed but it's the kind of rubber that requires a lot of effort to hit a solid fast drive. That extra effort needed just creates a bigger opportunity for error for a player of my level. This should not be close to your first choice of a driving rubber. Z3 is fortunately capable of good looping, mostly from the great spin it can create. It's capable of loops with some speed but shines the most at medium paced loops that are soaked in topspin rather than with all out loopkills. 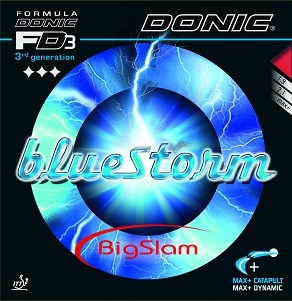 Bluestorm Big Slam features a firm topsheet with a medium soft 42 degree sponge. When squeezing the sponge, the drop from the 47 degree sponge found on Z1 and Z2 is significant. Big Slam is tied for having the softest sponge but the topsheet makes it feel a bit harder than Z3. Uniquely, Big Slam comes in Max, 2.0, 1.8, and 1.6 which is a different subset of thicknesses than the other Bluestorm rubbers. The topsheet is indeed noticeably grippy with that familiar German grain. Bluestorm Big Slam was a bit of a surprise to me in how it played. Despite having the same sponge hardness as Z3, the harder topsheet made it feel very different. It felt faster and more direct by a large margin. It's probably the most direct feeling inverted rubber of this sponge hardness and softer that I have ever used other than pips. The feeling is rather sharp and makes a decently loud snap on direct hits. I was surprised at how well this rubber could flat hit considering its softer sponge. The topsheet prevents it from being too dwelly and punches could be hit quite easily. The throw angle of this rubber is medium low. Spin is surprisingly high for a rubber of this throw angle and flat hitting ability. It's not quite at the same level of spin as Z3 but it's not far from. It does however, require some more effort to extract that spin than Z3 does. Serving with Big Slam was good. It's not quite as good as Z3 or even Z2. I would say it falls somewhere between Z2 and Z1. I prefer the softer topsheets of Z2 and Z3 considering these rubbers are completely non-tacky. The short game of Big Slam was a mixed bag. This is probably my favorite Bluestorm for speedy flicks, but I consider it lesser in regards to slow spinny flicks and for pushing where it again falls somewhere between Z2 and Z1. Big Slam comes second for chopping after Z3. The harder topsheet makes it worse than Z3 for me but the softer sponge and manageable speed allow me to perform chops to a decent degree and far better than the harder Bluestorms. This might be my favorite Bluestorm rubber for blocking. As mentioned earlier, flat hits work well so that translates into good blocking. The sharpness of this rubber allows for precision on blocks, the topsheet gives it some kick, helping it return to your opponent faster, and the lower throw angle allows for greater ease in handling incoming topspin. Lobbing, lifting, and fishing were better than Z3 but were still difficult to make it back to the table. At such a long distance, the ball runs out of steam fairly quick. A lot of effort needs to be made and even then, the spin and placement of the ball felt inconsistent and unstable. Driving is good but not great with Big Slam. It's better than Z3 at driving but worse than the other Bluestorms. I find Big Slam much better for shorter quick attacks rather than a fully wound drive but you can make it work well enough if the need for it arises. Just try to make sure that need isn't too frequent. Big Slam is not the best looping rubber but it's not bad. If you've boosted your Z1 Turbo, Big Slam is probably last on the list of Bluestorms in looping ability and second to last if you've left your Z1 Turbo unboosted. It can still generate decent spin but the longer the distance you are from the table, the weaker its attacking ability becomes. This rubber usually attacks best at close distance. As I had brought up early in the first part of my review, I've used many Donic rubbers in my years of playing table tennis. Throughout these years, my biggest problem with said rubbers have been durability. Every single Donic rubber I have used rapidly lost its playing characteristics after the first month and was mostly dead after the second. Has Donic fixed this issue with the new Bluestorms series? Well... Yes and no but mostly no. The Bluestorm series lasts longer than any other Donic rubber I have used so far. This is a big positive. Instead of one good month and dead after 2, I was able to get 2 good months and dead after 3. However, the even bigger negative is that despite the increased durability relative to other Donic rubbers, it still lasts a shorter time than most of its competitors. When you have brands like Tibhar lasting 4-6 months and Xiom lasting 6-12, I have a hard time rationalizing the purchase of a Donic rubber that doesn't perform any better than them even during its strongest first month or two. Testing these 5 Bluestorm rubbers was a long and wild ride. I will say that I was often surprised as to the characteristics of some of these rubbers. Despite the lesser durability when compared to other brands, I feel that some of these rubbers offer some unique attributes that some players might prefer over other options. I would say even enough to the point where it justifies purchasing a fresh sheet a bit more often than usual. I personally do not fall into that category but I'm sure that many people would. Of the Bluestorm series, I found Z2 to be of the most overall use to me and made for a good forehand rubber. On the backhand, Z3 fit me the best. Take careful consideration and really know your strengths, weaknesses, and style before choosing which Bluestorm is right for you!